Making YouTube Videos, Why Delay? Start making YouTube Videos Today! Many new youtubers hesitate and worry about making youtube videos. They worry about How To Start Making YouTube Videos and keep making excuses why they can’t start just yet. 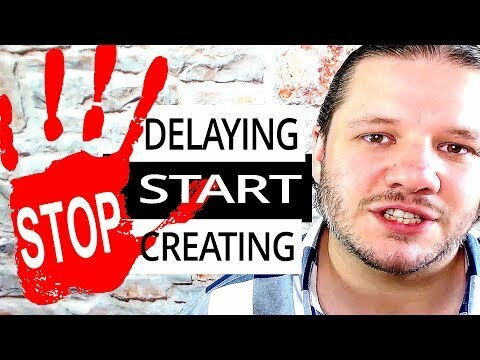 In this video Alan Spicer tells you to stop delaying and make youtube videos today – START CREATING! Everyone finds an excuse to delay making YouTube Videos. I tend to find people are worried about the quality of their first few videos, their YouTube video equipment or even over think how much time they need. It is this delaying that actually stops people from making YouTube videos entirely. Making YouTube Videos is an art that needs to be honed and practiced. The more YouTube videos you make the better you will get. When I started making videos in 2013 they was horrible, tinny, shaky and hard to watch. However, this gave me a baseline to improve from. I can look back at the video and take notes on what I need to improve. If each time you make a video you take notes and try and fix 1 thing that bothers you, it can act as a way to teach yourself to get better. After making YouTube videos for 2-3 months you should then be able to look back and see how much you have improved since day one…. but if you dont start….. you cant get better!